I have just finished reading Dorie Greenspan's masterpiece, Around My French Table: More than 300 Recipes from My Home to Yours. Published in 2010, this book gave rise to numerous blogs and web sites devoted to discussions of the recipes, and the experiences of the various writers in making them. The most notable of these is Fridays with Dorie, which recounts a four-year project to make all the recipes in the book. Having read most of the major French cookbooks, including more than ten by my idol Jacques Pépin and five by Patricia Wells in addition to the Julia Child books that started it all, I believe that Dorie's is the best. It is thoughtful, comprehensive (although not encyclopedic), authentic, well-written and beautifully illustrated. It is full of great insights, tips and interesting gastronomic history in addition to a cornucopia of carefully selected and well-edited recipes. While I do not aspire to make all 300+ recipes, I have made several already and plan to make many, many more. For example, her Mustard Batons, puff pastry sticks filled with Dijon mustard, have already become my go-to hors d'oeuvre. See my recent post on Celebrating the New Year for illustrations of the bâtons and the salmon rillettes mentioned below. Dorie's Salmon Rillettes are a classic rendition of the dish, less butter than the version I learned at cooking school but still satisfying. (I had less success with her Cheez-it-ish Crackers, which came out nice and cheesy but too crumbly, although they were perfect the next day when sprinkled over the soup next mentioned.) Creamy Cauliflower Soup Sans Cream is an elegant homage to the vegetable. Sour Cherry Clafoutis is a classic version of this wonderful way to take advantage of the too-short season for this amazing fruit. Finally, M Jacques Armagnac Chicken is an amazingly simple, but, as promised, complex braised dish that Dorie picked up from Jacques Drouot of the famous Dôme brasserie. There are lots more chicken dishes, and I plan to try them all. Also dozens of appealing appetizers, soups, vegetables, meat, fish, quiches and other egg dishes and a large array of classic desserts. Where the recipes presented are classics, Dorie sets forth imaginative variations in her bonnes idées set out in the margins. Where she deviates from the classic, which is most of the time, she often uses an accompanying bonne idée to tell the reader how to make the classic. 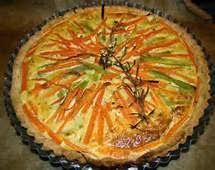 Here's an example, and one of the recipes I plan to try soon: a mustard tart with carrots and leeks, with the recipe for the more classic tomato mustard tart featured as a bonne idée. While I am not going to join the cook-the-whole-book cult, I will definitely be using many recipes from this book. 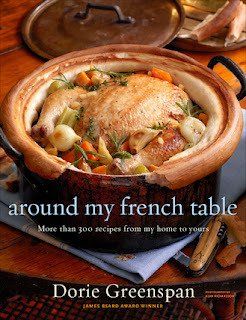 If you have room for only one book on French cooking -- and that would be a shame -- this is the one to get. 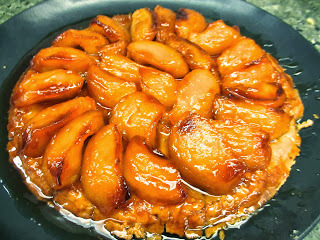 I'm still not jaded when it comes to Tarte Tatin. Although it's not my favorite dessert, it's great for company because (i) everyone loves it, (ii) it's really impressive and (iii) it can be made ahead. So I recently made one with what I thought was the official recipe, sanctioned by the Confrérie des Lichonneux de Tarte Tatin, a French society that is devoted to this delicacy (only in France: consider the AAAAA - Association Amicale des Amateurs d'Andouillette Authentique). Here's the result, which was very lovely but a little watery: slightly under-caramelized. I posted this on Facebook and had a surprising number of comments and questions. One asked for the recipe so I embarked on a search to make sure what I had used was in fact "official." It turned out that it was not, but rather a (very significantly simplified) adaptation published in the New York Times. That led me on a hunt for the real original, which in turn took me to French web sites. The Confrérie's web site does not have the official version, but I found a site that gives a recipe that purports to be the vraie chose. Adventurous French-speakers can find this at Sabine . . . En Quête de Cuisine. My quest was not over, however, as Sabine's recipe was in French and had a couple of steps too many. So I hunted until I found a reliable version from Dorie Greenspan that was published in Fine Cooking in 2010. Dorie's recipe is very similar, though in more detail, to the one I used, which is set forth below.